Many ancient Greek coins feature horses — like this one. 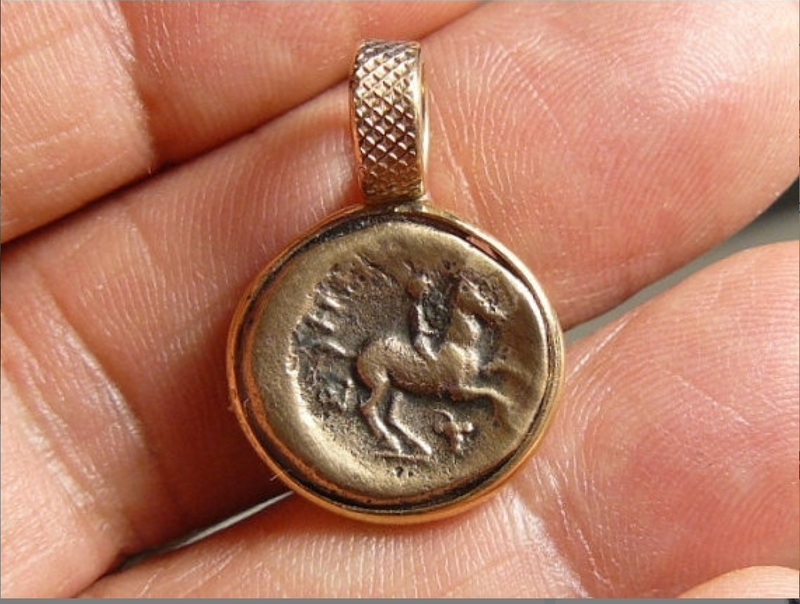 Coins from Maroneia, Thrace, celebrated the importance of horse breeding in the area. I’ve always loved ancient coins. There’s something magical about holding a 2000 year old coin in your hand and thinking about where it’s been, who held it in their hand, and what it was used to buy. While it’s very cool to find a coin in “mint” condition, there’s something very appealing about holding one that’s worn smooth by time and innumerable fingers. I have a particular affinity for ancient Greek coins — especially the one’s with horses on them. Over the years I’ve bought several of them. Since ancient coins were made by hand (the softened metal was placed between two carved stamps, or molds, and then hit with a hammer to transfer the images onto the blank), each coin is unique. Apollo is the son of Zeus and Leto. He is the god of light and the sun, truth and prophecy; medicine, healing, and plague; music, poetry, and the arts; and much more. The horse on the Greek coin is a commemorative of the races King Philip II won. King Philip II was an Olympic champion three times. In the 106th Olympics, in 356 BCE, he won the race, riding his horse. In the 107th Olympics, in 352 BCE, he won the four-horse chariot race. In the 108th Olympics, in 348 BCE, he was also the winner of the two colt chariot race. I am enjoying my coin pendant. It feels solid in my hand, heavy and important. And I do find myself wondering where it’s been. Somehow, I don’t think that our modern coins — identical from being mass produced — will invoke the same feeling of history and nostalgia. I love that piece. I have 3 or 4 coin necklaces, but they’re modern. I still like them because that coin still traveled around and so many people held it, plus it is just so much more interesting than a regular mass-produced pendant. I like a couple Etsy sellers as well, I have a lovely Austrian coin with a Lipizzaner, and a few Irish coins with horses too. And now I’ll have to look up your seller, thanks for the retail encouragement! I used to have a coin with Constantine’s picture on it. Sooo cool. I can’t find it. But I did pick up a widow’s mite when I was in Israel 3 years ago. I like old coins too. What a unique and beautiful piece of jewelry.